How Viable is Commuter Rail for North Carolina's Triangle? » North Carolina Railroad studies new commuter rail system in the state’s center, but its ridership estimates may be unrealistic considering the region’s demographics. The fastest-growing tech hubs in the United States are unified in their sprawling nature and provide definitive proof for at least one uncomfortable truth: the country’s smartest inhabitants aren’t necessarily rushing off to urban hubs. Despite the recent increase of wealthy, young, white inhabitants in many central cities — a reverse “white flight” — the overall trend suggests that the fastest-growing high-education metropolitan areas continue to be places with low overall density. According to a new report from the Brookings Institution, of the country’s 100 largest regions, 28 feature both high growth rates and high levels of educational achievement (what it categorizes as “Next Frontier” and “New Heartland”). Of those 28 regions, only two had higher transit use than the average of the 100 largest metros nationwide and only four had fewer people per capita who drive alone to work. Meanwhile, according to the “Sprawl Index,” calculated by Smart Growth America, only a third of those 28 regions were less sprawling than the average, based on street connectivity, centeredness, mixed-uses, and density. In other words, while central cities like New York and San Francisco may be coming back with an influx of new inhabitants, that growth has been overshadowed by increases in sprawling areas. Chief among them is North Carolina’s Triangle, presided over by the state capital in Raleigh, surrounded by the smaller cities of Durham, Cary, and Chapel Hill. With a population of 1.8 million, the region is the third most sprawling of all American regions says Smart Growth America, with the lowest levels of land use mixity in the country. According to the Brookings data, which refers specifically to the (arguably more sprawling) Raleigh-Cary section of the region, eighty percent of its workers drive to work alone, with only one percent using transit. It has increased in population by 35.4% since 2000. Now the North Carolina Railroad, a state-controlled organization that owns the state’s primary rail line, has released a study in which it estimates ridership along a potential commuter rail line that could stretch from Durham to Raleigh, via the suburban jobs-heavy Research Triangle Park, and then onwards in both directions as far as Goldsboro to the southeast and Greensboro to the west. Trains would run in each direction every forty minutes, though only during rush hours. The document, a follow-up to a capacity study completed in 2008 for the same corridor, projects as many as 4,600 daily riders if the system were activated today. By 2022, it suggests a daily ridership of more than 11,000 — enough to make it the country’s 13th-heaviest used commuter rail line, quite an achievement for the nation’s 29th-largest metropolitan area. The N.C. Railroad suggests that a 50-mile starter line between West Durham and Clayton, via downtown Raleigh, would attract the majority of riders. Both Raleigh and Durham are considering the implementation of their own electric light rail systems that would eventually connect. Raleigh’s line could extend from Cary to northeast Raleigh, via downtown and North Carolina State University; Durham’s would link east Durham with the University of North Carolina, via downtown and Duke University. Those light rail investments, which would in some places follow the same corridor as the commuter line, lack a funding source at the moment, though the region’s counties are considering bringing a 1/2-cent sales tax to vote in November 2011. But this proposed commuter rail line would be far cheaper to implement, costing only about $250 million to build, as compared to the more than one billion dollars that would be necessary for the light rail links. The Triangle is not a metropolitan region in the traditional sense, with a heavily populated and jobs-rich core. Rather, it’s a highly diffuse, polycentric place, with several jobs cores and no large neighborhoods made up primarily of apartment housing — in other words, it doesn’t have many areas ready-made for transit. The map below shows how jobs are spread out across the region in relation to the proposed commuter rail corridor. The question is how or even if fixed-guideway transit can be made to work in a place like this. Efficient public transportation is almost always highly dependent on heavily concentrated neighborhoods to which people can walk from stations. Though there are plenty examples of commuter lines with park and rides on one end, almost all rail line users from Boston to Portland have a work destination within walking distance of a station. Can a region like the Triangle adapt to an improved transit system? Does its existing commuting patterns make the use of anything other than the private vehicle possible? What seems clear is that the N.C. Railroad’s estimates of 11,000 daily riders by 2022 is unrealistic. With just four stations between downtown Raleigh and downtown Durham, the line would feature a very small total area within walkable distance of stations, reducing the potential rider base. Moreover, neither downtown is particularly large and the Raleigh station wouldn’t be directly adjacent to the jobs center. To make matters more difficult, the primary residence of most of the workers in each downtown is that respective city, not the other one. And neither south Durham nor North Raleigh, both areas of huge housing growth in recent years, would get stations. It’s worth considering how the proposed system compares to similar routes around the country. Austin’s new 32-mile Red Line commuter line, which offers just nine round-trips a day, all at rush hour, has been attracting around 1,000 daily users since it opened. Salt Lake City’s FrontRunner North, which shuttles commuters 44 miles into downtown from Ogden, is now carrying 5,000 people a day, with all-day two-way service. Could the Triangle, with more spread-out employment than those two regions, get more riders? Even if the answer is no, the goal of commuter railroad operations between Raleigh and Durham — something equivalent to more frequent Amtrak — isn’t an inherently bad idea. Any track improvements would aid in the movement of all intercity trains using the corridor. At a far lower cost than light rail, commuter rail would offer mobility between the region’s big cities, opening up the possibility of getting between the downtowns far more easily than is possible today. In addition, investing in commuter rail along the Raleigh-Durham corridor would open up the possibility of investing in light rail elsewhere. Durham Mayor Bill Bell has noted his fear that more frequent intercity trains would doom any hope of light rail between these two cities, but perhaps that’s a good thing — this route isn’t necessarily ideal for urban rail. It passes through the sprawling Research Triangle Park, whose suburban office park layout makes it hopeless for fixed guideway transit. Meanwhile, the densest non-downtown areas of both Durham and Raleigh aren’t on the line, meaning that ridership would be inherently limited compared to other potential corridors. Instead of spending big bucks on electric rail on this corridor, both Durham and Raleigh could concentrate on serving their own, potentially more rider-heavy lines. Most people who work in downtown Raleigh will continue to live in or near Raleigh — and the same can be said for Durham. The transit system should be designed to reflect that fact. It seems to me that a line like this should be tied into the national regional rail program. This line could operate more like a Caltrain with HSR than commuter rail in that there are going to be trains that go between the cities and then more frequent stops on a four track line. Ultimately though the HSR line could help pay for the more frequent line and also boost its level of service. 40 minutes is too long for me though. If electrified, I think every 30 would be smart, or even every 15 depending on speed. None of the Sunbelt cities has any business running commuter rail, least of all under the present FRA regulations. Suburban commuter rail needs to have some local transit to connect to. A few light rail lines that would shame any European city do not count as local transit. Even a medium-ridership system isn’t enough, not under a North American regulatory regime – just look at the low ridership of the West Coast Express. This region looks to me like a rather good candidate for BRT, particularly an Ottawa/Brisbane style open network focussed on existing corridors. It looks like using ay least some of the rail corridor makes sense, but the highways look to me like a better option for long stretches. The underlying philosophy of this piece is that development patterns should influence transit, but transit should not influence development. While I don’t think urban planners should completely overlook current density patterns, I do think a major function of mass transit is to steer development density patterns in the right direction. I think the underlying philosophy is that low-frequency, high-cost commuter rail is not going to influence development. I’ll be blunt and please feel free to come right back at me Yonah, but I think you’re too cynical about the chances for transit working in the Triangle and I have to wonder if it isn’t because of your background in the region. The idea that 4,500 people would ride the entire network daily from Goldsboro to Greensboro with the spur to Chapel Hill, if it were in place today, seems pretty reasonable to me. Remember, this is about 150 miles of commuter rail, and even though not much of the triangle is walkable, this network serves nearly every significant existing walkable area within the region. I also think the 11,000 by 2022 is perfectly reasonable. 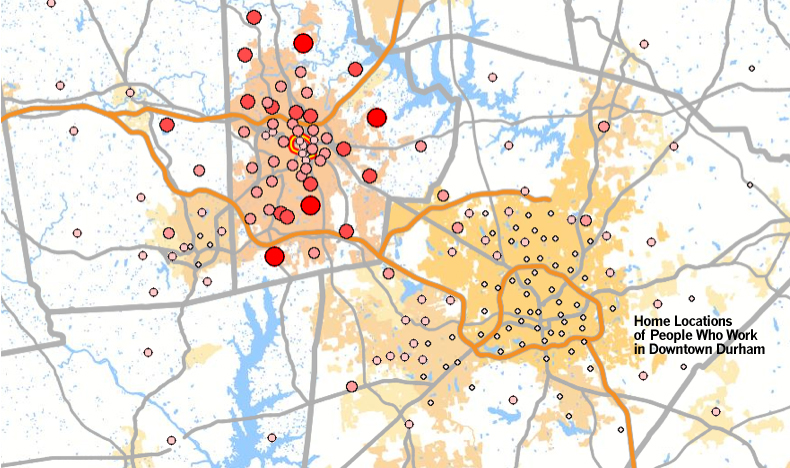 The Raleigh-Durham-Cary CSA is projected to DOUBLE its population from 2005-2025. I agree that we should question whether this is a wise starter investment for the region. But I think your criticism of the ridership numbers based on what appears to be little more than a gut feel, is a bit off. As for the off-peak service, by 2022, supposedly there will be high speed trains and more intercity trains by then. Between everything planned and everything under study, there’s supposed to be over 24 round trips between Raleigh and Durham per day by that time, with service all day. This study only covers the roughly nine or so all-stop “local” trains that will be plying the same route. I am not sure if the ridership numbers in this report were derived in a vacuum or took into account the other HSR and intercity train ridership as well. Also, the exact number and location of stations hasn’t really been planned yet. For this study they just assumed there would be one station every five miles, and plunked down a station somewhere within each five-mile stretch (no idea how or why they chose the specific spot.) They didn’t realign or make any changes to bus routes to accommodate this. These were all simplifying assumptions. You may have a point — I may be more likely to be cynical here simply because I’m from Durham and therefore more likely to wonder whether it’s a place where a significant investment like this would be functional. However, I am not sure I agree with you about the ridership estimates, which still seem too high for me. You are right that the stations suggested in the study are not specific, but the fact that there would only be four of them between Downtown Durham and Raleigh — wherever they are — is what is worrying to me: the fewer the stops, the fewer the people within walking distance. I think that there could be grounds to assume significantly more riders if there were more stations. Second, I think we need to look very seriously at the maps I put at the end of the post, which show home locations of people working in downtown Raleigh and downtown Durham, respectively. The data show overwhelming concentration of people who work in downtown Raleigh living in Wake County, and an overwhelming concentration of people who work in downtown Durham living in Durham County. Similar systems, like Austin’s Red Line, have at least connected areas within the commute shed of the downtown. There simply aren’t that many people in the commute sheds of the two Triangle downtowns at the other side of the region. The fact that Triangle Transit only has about 4,000 daily bus riders today should not be dismissed. Is it reasonable to expect double the ridership of all the existing intercity buses in the Triangle on a new rail line between Raleigh and Durham, even with record growth in the next decade? I do want to see a more in-depth study of this corridor — I do have a gut feeling that these projections are off. My biggest concern, I suppose, is what you pinpointed: that there may be better investments possible for the Triangle. 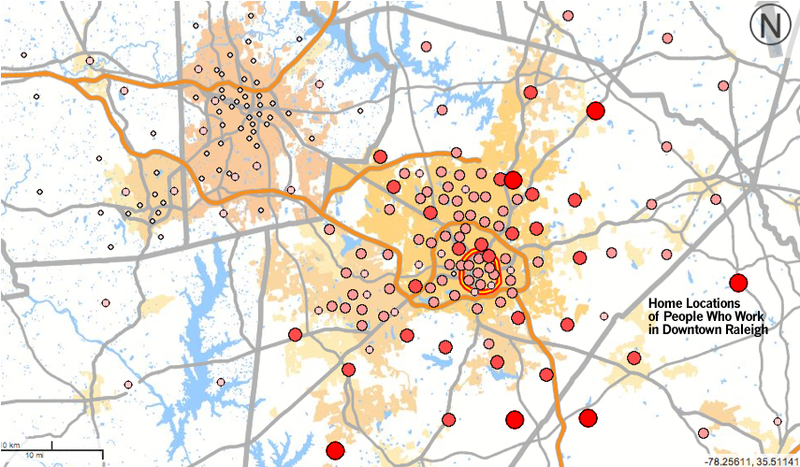 Let’s look again at those commute sheds for Raleigh and Durham, identify where people live and work, and go from there. The Raleigh-Durham link certainly isn’t premised on that. All that said, if the state wants to invest in the corridor for the benefit of improving intercity rail across the state, power to them. Why not? It’s happened before in other places. Intercity buses are painfully unpopular and intercity trains don’t suffer the same stigma. NCRR has not been known for overly optimistic estimates, so I wouldn’t be surprised if they actually know what they’re doing. Speaking as a rider of an intercity bus (in this case, TTA’s Durham-to-Raleigh line), I can tell you that I really appreciate and like it. So much so that I would probably stick with it even after a commuter train arrived, because TTA’s current travel time estimation between Durham and Raleigh is longer than what I have now. I have a long personal history with public transportation (including rail), I am politically liberal and would support a tax to pay for commuter rail improvements, and I am a current TTA consumer. But if I won’t make the switch to rail because it takes longer than my current commute, how much less likely will the rest of the area’s residents? That’s… not an impressive TTA rail plan, is it? I’m not actually sure Raleigh to Durham counts as an intercity bus. It’s too short. Sure it technically is, but we don’t call New York-Newark “intercity”. Hmm. sparse stop spacing allows high average speeds. With 5 miles between stops, 30 s station dwells, recent EMUs (160 km/h, 0.8-1.0 m/s^2) and 10% schedule slack, average speed gets around 100 km/h or slightly over 60 mph. If the stops are arranged so major destinations are within their catchment area (or give companies incentive to run shuttle buses) and buses are arranged to provide timed transfer with rail, the service should be attractive even in such low-density area. The plan calls for FRA-compliant diesel trains, and most likely has nothing even vaguely resembling timed transfers. Maybe something like the Karlsruhe Model migh work? Tamtrains running like heavy rail on the trunk line and as a streetcar in the suburbs (easily expanded in later stages)? Might be especially useful if somewhere in the future HSR stops in one of the two cities … but will the FRA allow it? Such vehicle would have over 20 kW/t fully loaded so it would match performance of moder european EMUs and regenerative braking would remove most added consupmtion due to FRA-needed weight. Note that all necessary technology has already been developed and proved in operation and most of it is available from U.S. factories, so competent builder can bring such vehicles to operation in 2-3 years and vehicles can be Buy America-compatible. Trying to serve vast low-density area without integrated schedules is a recipe for failure. Oh, it’s certainly possible. But it requires a custom-made train design, which is a recipe for astronomical costs. Last time the US tried to clone a high-performance European design within the FRA regime, it got the Acela. It’s also likely that the plan calls for low platforms rather than high platforms. I can’t find information, but the plan documents Yonah links to contain such gems as “Most light rail lines are powered by overhead electric wires, which is incompatible with diesel powered freight engines and freight cars” and a call for four morning trains, four afternoon trains, and one midday trains. Despite the fact that the corridor has 12-14 freight trains per day and is only planned to have 9 passenger trains per day, the plan calls for four-tracking the line. Well, the custom-based desingn could be M-7 with different existing traction equipment – much simpler task than than brand-new high-speed train with a lot of new components. What will be the FRA’s position on “time separation” for a corridor with Positive Train Control … how closely mingled will the heavy freight and non-heavy freight slots be allowed to be? With a tram-train, aka Rapid Streetcar, it would be possible to overcome much of the problem of the sprawl with short streetcar sections running into the rail corridor at both sides – a gated switch rather than gates intersection, IOW – stretching the effective reach of the local sections. The Express would just run through in the corridor. The capacity of each trainset would be less, but they could be run more frequently – more like 20 minute frequency in peak than 40 minute. Fixed guideway systems rarely work for dispersed origins and dispersed destinations, which is exactly what exists in the Triangle (particularly RTP & Wake County: Cary, where I grew up, is the very picture of multinucleated sprawl). BRT’s ability to provide one-seat rides for both feeder and trunk service makes much more sense for this region. The one corridor where rail service might find dense, balanced loads (IIRC) was 15-501 between Durham-CH, but the capital costs might prove prohibitive. I’m not sure how well NCRR’s regional rail proposal would work, either; perhaps it better compares to commuter-intercity services like Amtrak’s Capitols or Surfliner? Where I disagree is on the demographic prospects for regional population growth. Looking at numbers (not percentages), both NYC and Chicago are still among the 10 fastest growing metro areas, and much of that population growth is actually taking place in the denser parts of those regions. In terms of new households, I’d be curious to see whether the 2010 numbers show that cities are gaining lots of small new households — seems that places like Raleigh get a lot of young families, which pumps up their population figures more than singles/couples would. Fixed guideway infrastructure investments must also include a substantial and dense real estate development component at the station areas to generate ridership in low-density metro areas. Local jurisdictions would also need to enact complementary land use regulations to restrict the lateral expansion of their regions and encourage growth in the transit corridor. I don’t believe a Sunbelt city can retrofit itself to accommodate transit without targeting the nexus between land use and transportation policy and any attempt to do so will likely result in disappointing ridership figures. This plan, though good, must be the tip of a much larger and more robust regulatory arrow.